Click on images and links for enlarged view. 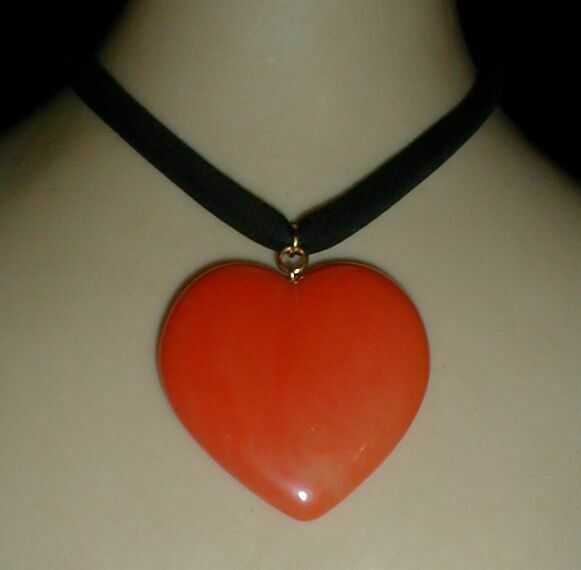 A deep rich coral color faintly marbled in yellow tones warms anyone to this organic shape heart pendant. Executed in solid polished opaque Lucite and shown here on a black thick soft cord, it can be hung on your choice of chain or wire too. Front and back of pendant are identical. Matte goldplated bail ring. Cord not included. 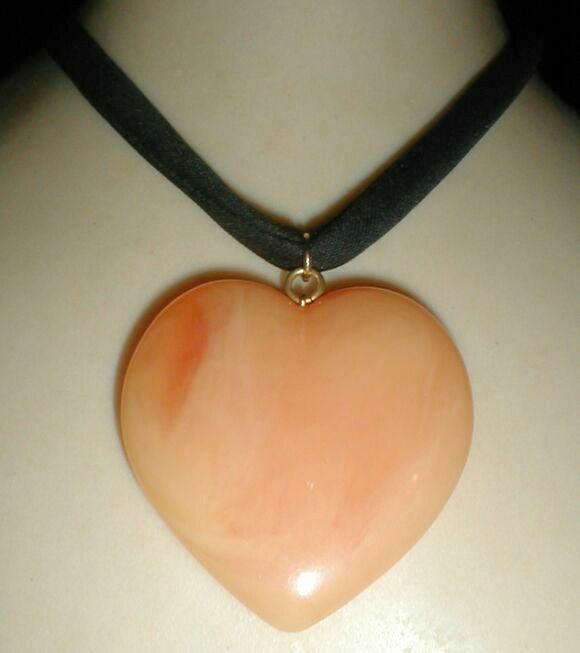 Size: 2.5" H x 2.5" W.
A warm butterscotch color faintly marbled in rose tones makes this organic shape heart pendant an instant conversation piece. Executed in solid polished opaque Lucite and shown here on a black thick soft cord, it can be hung on your choice of chain or wire too. Front and back of pendant are identical. Matte goldplated bail ring. Cord not included. 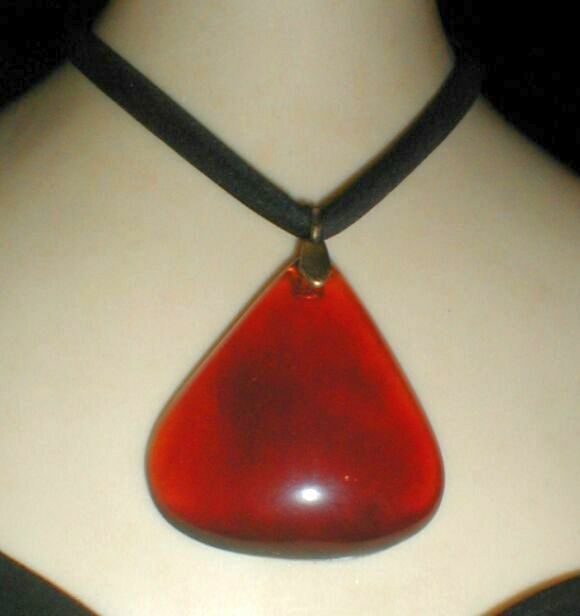 A deep translucent rootbeer color distinguishes this organic shape triangle pendant executed in in solid polished Lucite. Shown here on a black thick soft cord, it can be hung on your choice of chain or wire too. Front is domed, back is flat to hang perfectly. Matte goldplated bail. Cord not included. 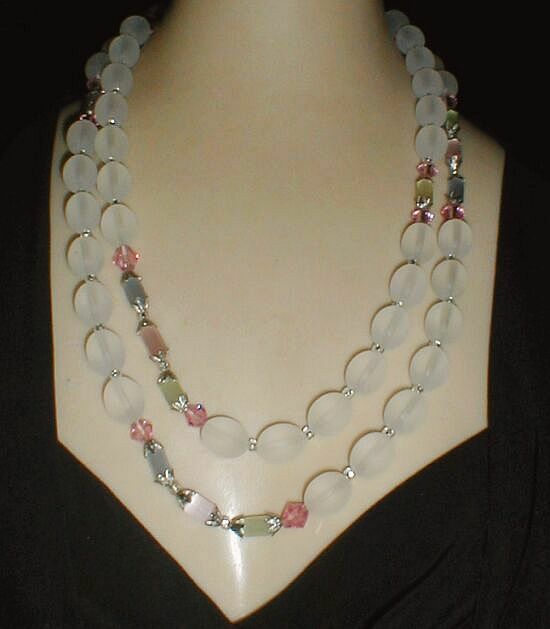 Size: 3" H x 2.5" W.
Translucent white Lucite oval beads and crystal spacers in fun length are accented with long pastel crystal bead and pink faceted crystal stations. 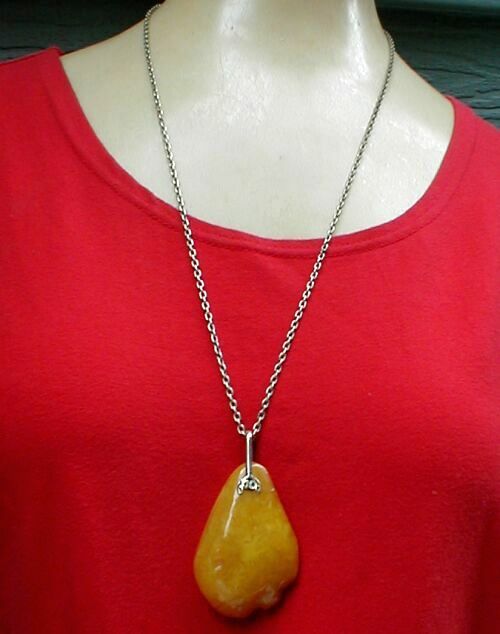 Size: 50" long with barrel clasp, Lucite beads 12 mm long approx. 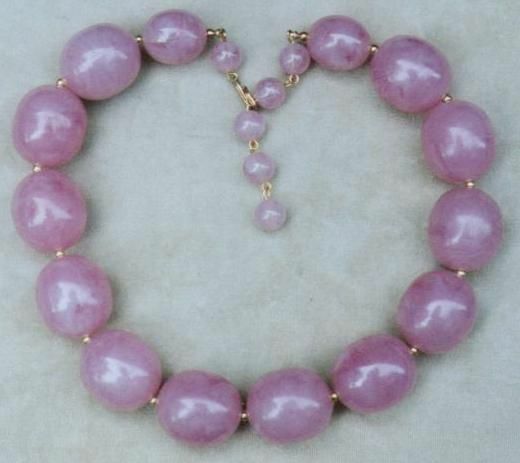 Marbleized mauve color fat oval thermoset solid plastic beads. Size: Adjustable to 18" neck length, beads 1" long. 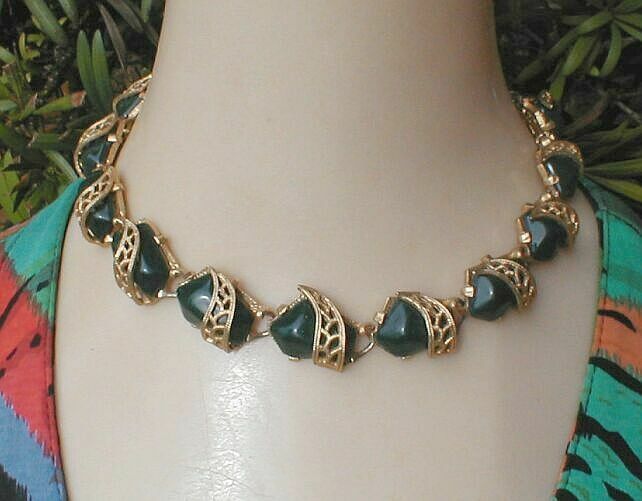 Eleven faceted but smooth finish deep green bakelite stones peek out from under superimposed goldplated filigree swirls in this charming early 1950s choker with adjustable chain closure. Goldplated florentine finish links. Sizes: Chain is adjustable to 15 3/4". Links are 5/8" wide approx. Condition: Excellent florentine goldplated finish back and front. Only the brass hook and chain show a little verdigris. 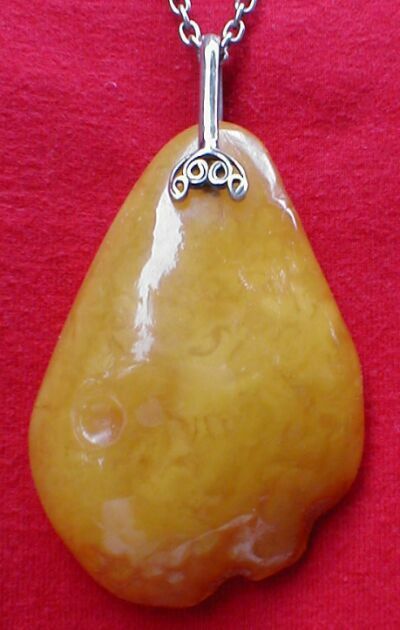 If you like genuine amber for its smoothness, instant fashion impact and maybe its mystical qualities, this one has it all. Chain and bail setting appear to be sterling but is not so marked. View extreme closeup of pendant here. Pendant size: 1 1/2" W x 2 1/4" H, plus bail. Chain: 26" L.
Use the Add to Cart buttons on the shopping pages to select your styles, enter number of pieces and Update in the Shopping Cart summary at any time. If you have questions do email Liz or call. Credit card convenience is available through the Shopping Cart courtesy PayPal. Direct VISA/MC convenience is also available, by phone to Liz. If you wish to use this payment option, do not use the Shopping Cart, just call Liz with your selections.